It’s a sad fact of life that as skin ages it stops producing collagen and elastin, which are vital to maintain soft smooth skin. Skin also becomes drier and, now I’m in my early 60s, my skin certainly has. In order to address this I have been using the Clarins Super Restorative Range over the last several months - literally night and day. If during this time the "Magical plant from Madagascar" contained in the Super Restorative Range failed to deliver, I was fully prepared to "jump ship". You see I was nurturing my skin for a very important event: my only son's wedding. I was prepared to be a very harsh critic, as my expectations were high from the outset. And the results? Amazing. I've used every tiny bit of the day and night creams. My facial skin feels smoother and more nourished. My makeup sits beautifully on my skin. My eye and cheek areas are without doubt less lined and I've gained so much confidence that I go without make up for days - which is unheard of for me. The one area where I am still hoping for more improvement is the area above my upper lip. I still have more fine lines there than I’d like. I do think the remodelling serum is helping this area to be more hydrated, so it looks more plumped up and less crinkly in appearance. To say I'm hooked on this range is probably an understatement. 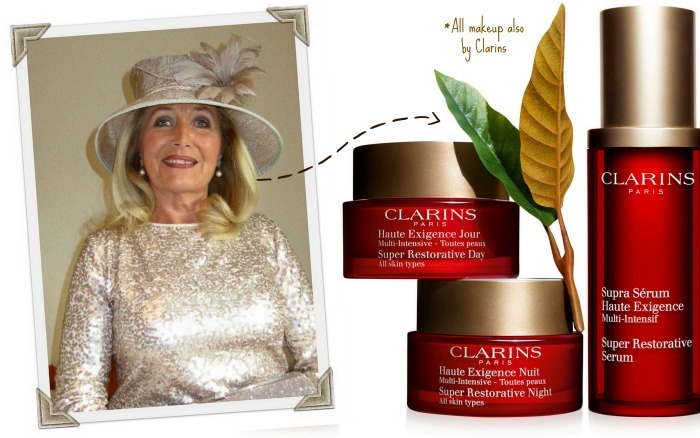 Thank you all involved, for bringing Clarins Super Restorative cream to my attention. The Clarins Super Restorative range is priced from €36 for the wake-up lotion; read more about it here or browse the range online.